FBI Agent Paul Falcon has been stymied by "The Lady Killer," a murderer who has no discernible pattern and the ability to never get caught. When Ann Silver brings him evidence that could crack his case wide open, he is intrigued by the small town cop with so many secrets. She seems to be a contradiction in terms - a small town sheriff and the Midwest Homicide Investigator, a confident cop and a quiet author, and someone who values time to be alone but knows vice presidents and US marshals. As the case becomes bigger and more complicated than Paul could have ever imagined, will he and Ann find room for each other in their lives? Ms. Henderson's O'Malley series is one of my favorites. I've read each book multiple times and shared them with lots of friends and family members. I was thrilled to discover that she was writing a new book after several years of publishing silence. 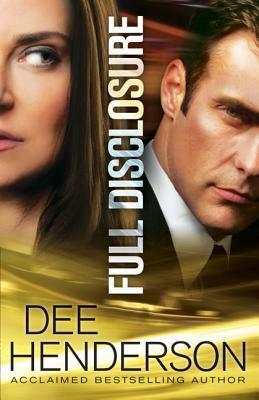 Full Disclosure is a great read and I'm really intrigued by the ways she uses characters from her previous novels in this new one. I don't want to give it away but suffice it to say that if you have loved her other characters, you will be interested in reading this one. One of the things that I appreciated in this novel was the maturity of the characters and their views on relationships. Both characters are older and established in their careers and their routines. They have each had relationships that did not work out and wonder if they will ever find someone that will fit in their life without completely changing it. In an age where we are constantly reading about characters that 'fall in love at first sight,' it was refreshing to read about characters who felt an interest and started talking to people who they trusted. Ann and Paul both consult people who know the other in an effort to discover whether they can overcome some significant relationship hurdles before they get their hearts broken. I will admit that I felt, at times, that the relationship was drawn out for too long. I liked that they recognized potential problems and worked to fix them before they got hurt. I also thought it made a lot of sense for them to get to know each other from a distance before becoming romantically involved. But this is the longest book of Henderson's that I have read and I wished that some scenes had been cut because they started to grow repetitive. The mystery that Paul and Ann are investigating is a thrilling one. Since I've read many of Henderson's other suspense novels, I know that the lady can write some tension. There are a lot of twists and turns to be discovered and while I guessed some of them before the big reveal, it didn't mean that I wasn't quickly flipping pages to find out how they would affect Paul and Ann. Full Disclosure is a great read for anyone who is looking to read a story about a more mature relationship that doesn't involve love triangles or love at first sight. It's also a great pick for anyone who likes a good mystery that will keep you eagerly turning pages. While I would have loved a shorter incarnation of this story, I was excited to meet Ann and Paul and I am glad to add their book to my shelf of Henderson novels. P.S. I really don't like the cover. I don't talk about covers very often, but this one makes both Paul and Ann look mean and sketchy. This looks great. You know, I've heard of her before but I don't think I've read anything of hers. Maybe I need to double check that. Oh....maybe I have some by her on my Kindle. Thanks for the review. She is one of my favorites. I would recommend starting with Danger in the Shadows, which is the prequel to the O'Malley series. I hope you enjoy!